Do you walk the same distance and pace most every day? Do you feel like your fitness improvement has stalled? Do you want to prepare for a walking race, relay, or marathon? Time for a schedule with a variety of walking workouts. This weekly suggested schedule, developed by Dave McGovern for his racewalk clinics, is for every kind of walker, including fitness walkers and racewalkers. You can mix and match the workouts below. The week should include one day of Economy workouts to build speed, two days of Threshold workouts to build aerobic performance, and one day of long distance. In between each of these workouts should be a rest day or a day of easy walking. Tuesday: Economy Workout. Warm up for 10 minutes at an easy pace. Then walk as fast as you can for 30 seconds or 200 meters (two city blocks in most cities). After 30 seconds, drop down to an easy pace for 2 minutes. Repeat the 30 seconds speed/2 minutes rest 8 to 12 times. Cool down with a 10-minute easy pace walk. Wednesday: Recovery. Easy 3-mile walk at 65% to 70% of your max heart rate. This is a pace at which you can easily maintain a conversation but are breathing harder than at rest. Thursday: Threshold Workout #1 - Speed. 10-minute warm up at easy walking pace. Walk fast for 8 minutes or 1 kilometer at 85% to 92% of your max heart rate. Then slow down to an easy pace for 2 minutes. Repeat this for 3 to 4 repetitions. Cool down for 10 minutes at an easy pace. The threshold pace is strenuous, but one you could maintain throughout a 10 kilometer/6 mile race. You will be breathing very hard and able to speak only in short phrases. Friday: Recovery. Easy 3-mile walk at 65% to 70% of your max heart rate. Saturday: Threshold Workout #2: Steady state or tempo workout. Warm up for 10 minutes at an easy pace. Walk 20 to 30 minutes at 85% of your max heart rate then cool down with 10 minutes easy pace. Sunday: Distance Workout. 8 to 12 kilometers (5 to 7 miles) at 70 to 75% of your max heart rate. This is a conversational pace. The key to these workouts is not to exceed your lactate threshold -- working out so hard and long that your body builds up lactic acid in the muscles. This occurs when you workout at 90% or more of your maximum heart rate for more than 50 minutes. By knowing your maximum heart rate and using a heart rate monitor, you can ensure that you are working out at the right pace for the various workouts. This variety of workouts will ensure you get slow fat-burning workouts, aerobic carb-burning workouts that also build and feed your muscles, and avoid over-training and anaerobic workouts. 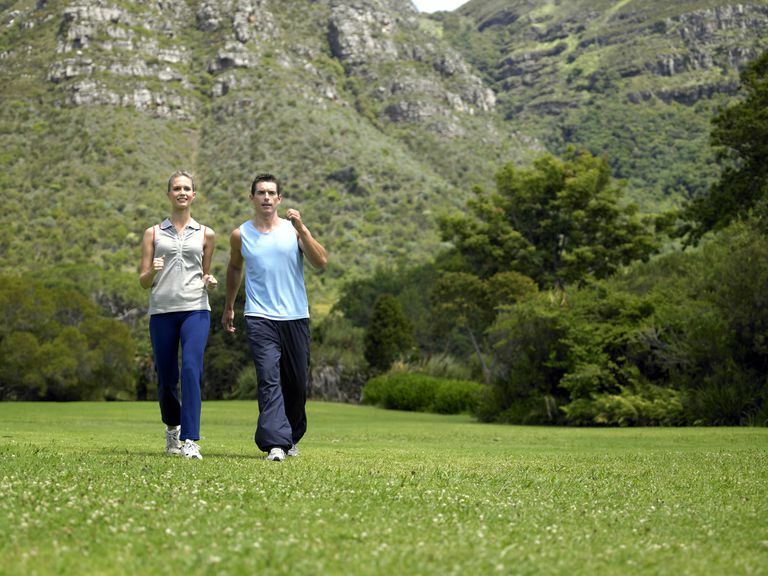 Varying your walking workouts will help build different aspects of fitness: speed, endurance, aerobic capacity. For each workout, be sure to stop after 10 minutes and do some easy stretching. For the workouts above 70% of maximum heart rate (MHR), do a 10-minute warm-up walk at an easy pace, stretch, then speed up to the suggested rate. When the faster walking is done, slow down to an easy pace for 10 minutes and finish with stretching. If you have only 15 minutes to get in a good walk, use these tips to maximize your 15-minute walk. 1. Easy Health Walk: 30 minutes daily at 50% to 60% of MHR. This is a purposeful but comfortable pace. Builds long-term health and well-being. 2. Weight Control Walk or Fat Burning Walk: 60% to 70% of MHR for 45 to 60 minutes daily. This is a brisk pace with noticeable breathing but you can still carry on a conversation. The longer time period at this moderate pace will burn calories and give the body time to draw on its fat stores for energy. 3. Distance/Endurance Walk: 65% to 80% of MHR for 5 to 10 miles. Once per week. Builds endurance. If you are planning to participate in a 5K or 10K race, your distance walk should exceed the race distance by a mile or two. Joining in a local non-competitive 10K volkssport walk is a perfect way to include this workout. 4. Aerobic Walk: 70% to 80% of MHR for 20 to 60 minutes, every other day. On the days in between, do the easy health walk or weight control walk. This is quick walking with noticeable breathing, but not out of breath. Improves aerobic fitness. 5. Athletic Performance Walk (Threshold): 80% to 92% of MHR for no more than 50 minutes. Once to three times per week, always with an easier or rest day in between. See the suggested walking week below for some formats for these walks. This is fast walking with heavy breathing and you may have to adopt racewalk technique or jog to attain this heart rate. 6. Economy Workouts: This workout uses short bouts of walking as fast as you can for 30 seconds, slow for 2 minutes, repeat 8 to 12 times. For racewalkers, this builds speed ability and technique. Once per week. You will need to know your MHR to ensure you are working out at the right pace. Your maximum heart rate is determined by your genetic make-up, gender, and age. The rule-of-thumb formulas work for many people, but the only accurate method is to have it tested by a cardiologist or exercise physiologist by a treadmill stress test, or by an experienced coach under field conditions. If you are over the age of 35, overweight, have been sedentary for several years, or have a history of heart disease in your family, testing is recommended. Find what your target heart rate should be in. Enter your age and target percentage to see the desired beats per minute. Heart Rate Monitors - Before You Buy: What to look for in a heart rate monitor, pulse monitor or app. Jackson, Andrew S. Estimating Maximum Heart Rate From Age: Is It a Linear Relationship? Med Sci Sports Exerc. 39(5):821, May 2007.